Firm name, office address, phone, fax, contact e-mail, postal address (country, state, city, ZIP code, P.O.Box), website. Stage preferences, fund size, funding needed and industry preferences. The United States, Canada, Europe, Israel, Australia, and a variety of East-Asian locations such as Hong-Kong, Singapore, Taiwan, and Japan. Our software displays over 5,100 firms in categories, based on stage preference, industry preference, and location. The user easily locates the investors most suited to his particular needs, and can contact these firms via e-mail from within #‘s program. The software interface is simple and clear. All information is available offline – no internet connection is needed to view the database. The main part of the #‘s application screen is covered by a tabbed window containing three selectable panels. Click on the Info tab to activate the Info panel. Here you can find useful information about the program and adjust configurable settings. If your computer is connected to the internet, you can also browse here the websites of selected venture capital firms. Click on the Find tab to activate the Find panel. Here you can specify detailed search criteria and execute the query. Results of successful query will appear in the third panel. Click on the Lists tab to activate the Lists panel. 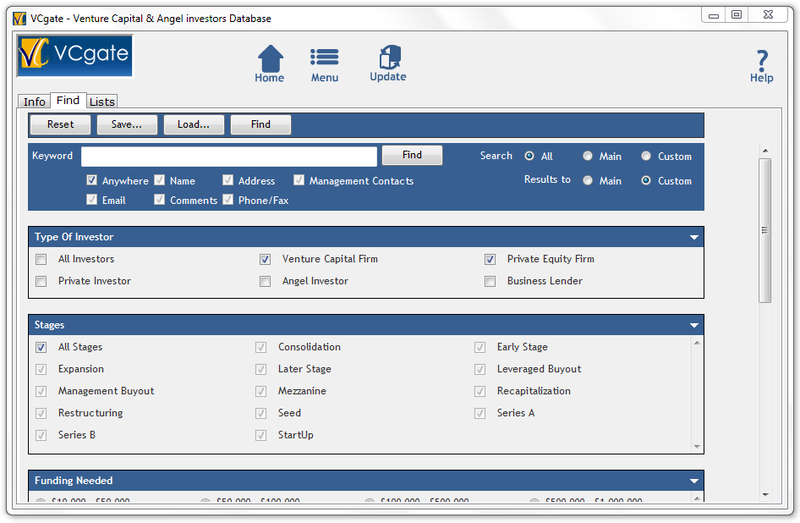 There you can explore and customize information about venture capital firms, organized in easy to survey lists. During the work with # you can use graphic buttons at the top of the screen to quickly recall the startup screen, display help information for the current operation, register the product online, or activate the popup menu. Note that the same menu can be also activated by right-clicking on any unused part of the interface. …is the first panel displayed after startup. It can be recalled by clicking on the Info tab, or from the popup menu. Here, you can browse some USEFUL LINKS, learn how to CONTACT US, enable full functionality by REGISTERing the application, or read the HELP information. 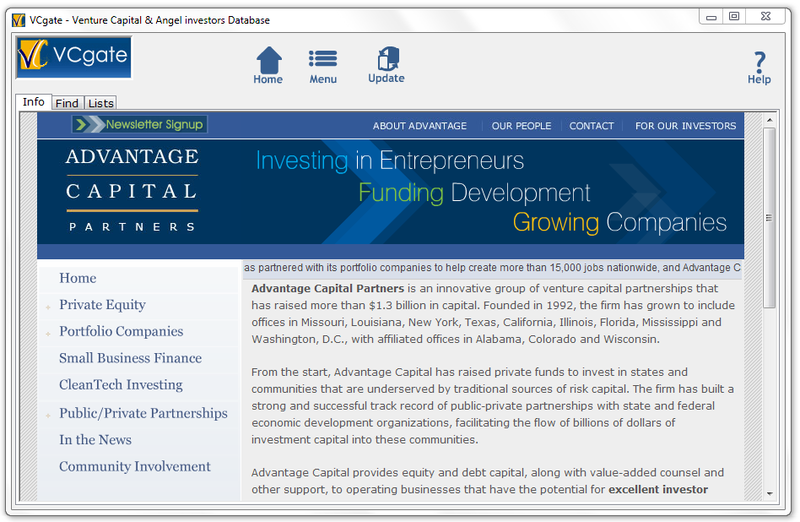 The Info panel also allows you to browse websites of selected venture capital firms (after double-clicking on their url in the Lists panel). …can be viewed by clicking on the Find tab, or from the popup menu. Click on the criteria you want to use for your search. To deactivate a particular search category, click on the checkbox to remove the checkmark. To search for a particular keyword, use the first category entitled KEYWORD. 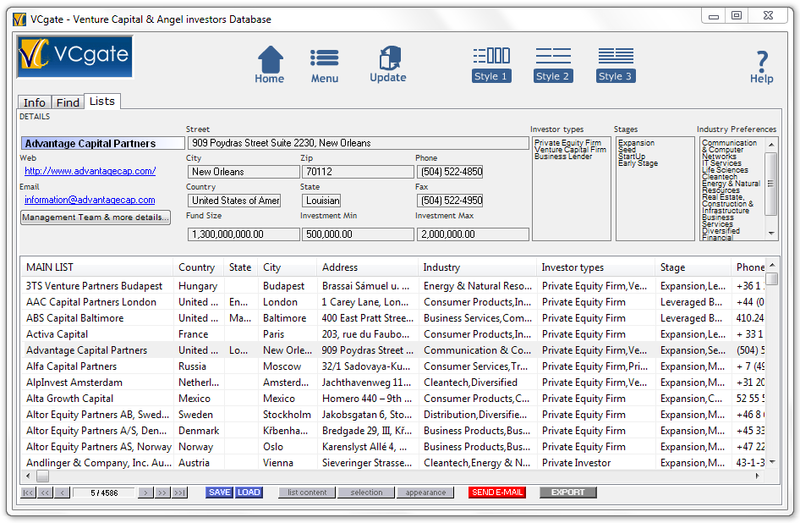 All (the entire database), Main, or Custom – and where the matching firm profiles will be listed (main or custom). Search criteria can be saved for later use. For saving and loading, use the buttons at the top of the panel in the search criteria box. 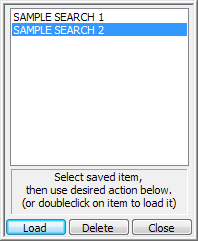 To save the search criteria, click on SAVE, then type the desired name in the popup box (or select an existing name), and hit Save. To load or delete previously saved search criteria, click on LOAD, then select the name of the saved search criteria from the list, and hit Load or Delete. To reset all search criteria to the default state, click on RESET. The save, load, delete, and reset functions can be also found in the popup menu. …can be viewed by clicking on the Lists tab, or from the popup menu. You can organize your results into two lists: the main list and custom list. The main list is always visible. By default, it contains all firms in the database (or search results after a successful search). If more than one list is needed, you can activate the custom list displayed above the main list. By default, the custom list is hidden until it contains any data. To unhide it, click on the appearance button on the bottom of the screen and select Show custom list, or right click on the main list and select Show custom list. Note that the custom list will appear automatically when new data is added to it. To add a firm to your custom list, double-click on any firm in the main list. To quickly open a firms website or send a message, double-click on its URL or e-mail address in the list. If you prefer to open the website in external browser, click on the corresponding link at the top of the screen, where details for a currently selected line are displayed. Below each list, there is a line containing buttons for managing the list. On the left, there are six buttons for navigation. Between them, there is a field with information about your currently selected position and total number of firms in the list. The list content button activates a popup menu for manipulating the entire list content. 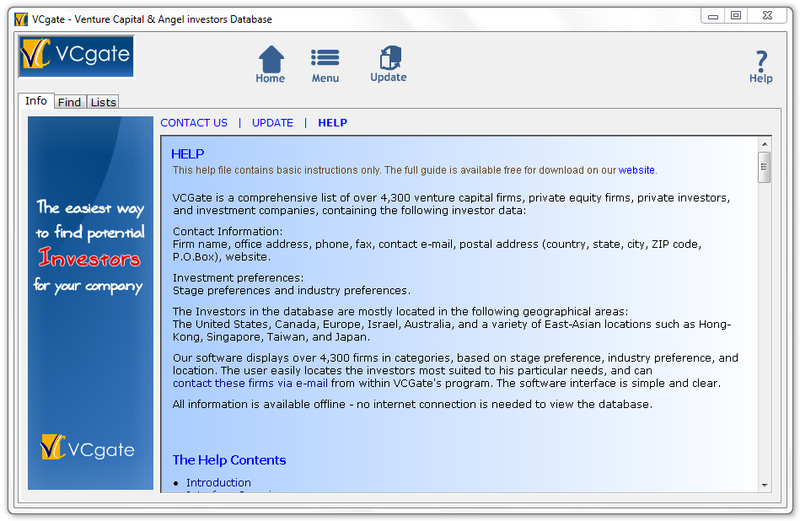 The selection button activates a similar popup menu for manipulating only the highlighted firms. You can highlight more than one firm by holding down the CTRL key while left-clicking or holding down the SHIFT key while left-clicking. The appearance button activates a popup menu for setting the list display style and sort order. These functions are also available from the popup menu activated by right-clicking on the list. The top part of the panel contains detailed information about the selected item. You can choose one of three possible display styles by clicking one of the three Style buttons at the top of the screen. You can also click on the appearance button on the bottom of the screen and select View style or right-click on the list and choose View style from the popup menu. Each of the lists can be displayed in brief or full mode. To switch the mode, click on the appearance button on the bottom of the screen and select Full lines or Names only from the popup menu. The content of each list can be sorted by specified criteria. In full view mode, sorting can be done by clicking on the desired column heading. To toggle between ascending and descending order, click the heading again. You can also click on the appearance button on the bottom of the screen and select Sort order or right-click on the list and choose Sort order from the popup menu. In full view mode, you can adjust a width of any column by dragging the right side of its heading. You can also change column’s horizontal position by dragging its heading in the middle and dropping it at the desired place. The content of each list can be saved for later use. For saving and loading, use the buttons on the menu line below the list. To save the content of the list, click on SAVE, then type the desired name into the popup box (or select an existing name to replace it), and hit Save. To load or delete the previously saved content of the list, click on LOAD, then select the name of the saved list from the popup window, and hit Load or Delete. The save, load and delete functions can also be found by clicking on the list content button below the list or by right-clicking on the list. The SEND E-MAIL button allows you to send your business plan to all your preferred firms at once. Send e-mails to firms listed in either the main or custom lists. At the bottom of the list you wish to contact, there is a red button entitled: SEND E-MAIL. Click it and choose between To whole list, which will generate a mailing list of all firms, or To selected, which targets only the highlighted firms. A box will pop up – you will be told the number of firms with valid e-mail addresses. Some firms may only have web-based contacts, so that you can send messages to them only by filling out the form on their website. The number of such firms will also be also reported. To get the lists of all web-based contacts and e-mail addresses during message creation, select the create contact list option. If you select a large number of firms, # will create multiple e-mails with a specified maximum number of recipients per e-mail. The number of recipients per e-mail can be set in the field max. recipients per message. The maximum possible number depends on your e-mail client, operating system and configuration. 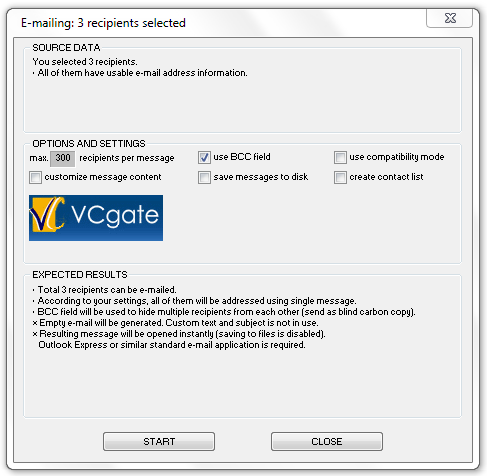 For your convenience, messages can be addressed using the BCC field (sent as blind carbon copy) to hide multiple recipients from each other. If you selected more than one firm as an e-mail recipient and you prefer that recipients do not see their names among a list of multiple recipients, check the use BCC field box. The mailing list will be added to the BCC line of your e-mail composition. This will hide multiple recipients from each other. Otherwise, recipients will see all names on the mailing list. Select customize message content to specify the default message text and subject. New editable fields will appear where you can specify default message subject and text. After setting the options, you can start message creation by pressing the Start button. If the save messages to disk option is selected, messages will be stored to the folder you specify. From there, they can be opened later with your e-mail client, edited, or moved to the e-mail server. Otherwise, each created message will appear in your default e-mail client program. Note that you need to have a standard e-mail client (such as Microsoft Outlook, Microsoft Outlook Express or Netscape Messaging) installed and properly configured for sending e-mails. If your e-mail client program has trouble handling standard .eml files, try to select the use compatibility mode option. # will transfer created messages to the e-mail application using mailto-protocol (method used when you click on any e-mail hyperlink on the web). Compatibility mode allows only limited number of recipients per message and short predefined text. Actual limits depend on your installed software and operating system. You can export the content of the main or custom lists. Click the EXPORT button at the bottom right of the desired list, and select the desired export format. Choose between pure text, web page (html), and CSV – delimited text (suitable for importing to programs like Microsoft Excel or Access). If # is not registered, the amount of data is restricted. To get # full access, you need to purchase a registration code. It can be ordered directly from the software, or from our website. 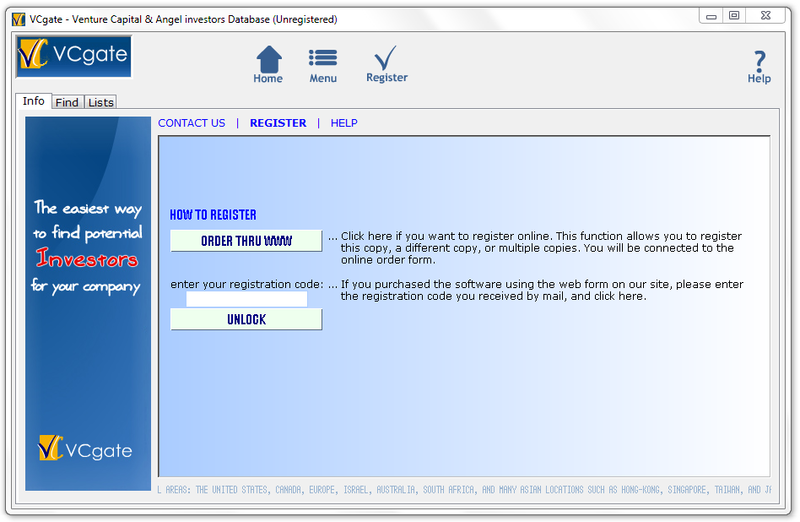 For more information, press the Register button on the top of the screen. If you click Direct Activation, you will see a page with a secure order form. Fill out the required information, then click continue. Enter your credit card information, then click the “Make Payment” button. Once the transaction is completed, # will perform an Online Update. You will then have full access to the 4,600+ firm listings. You will be able to access the firm list while online or offline. If you choose Order thru WWW, you will be brought to the # Online Secure Order page. Fill out the required information, then click continue. Enter your credit card information, then click the “Make Payment” button. Once the transaction is completed, you will receive an auto-reply e-mail with your registration code and registration instructions. After receiving the registration code, click on the Register button, enter your registration code in the box provided and click to continue. The software will attempt to retrieve your license through the # web server. You will need to be connected to the internet in order for this registration option to work. After registration is complete, you will be able to view the 5,100+ firm list while online or offline. In the registered version of #, you can use the Online Update feature to download most recent additions to the database directly from the server. To check for available updates, ensure that your computer is connected to the internet, click on the Update button, and press ONLINE UPDATE. You will see information about the most recent update available on the server. If your database doesn’t already contain the update and your lincense is not expired, download will start automatically. In case of any errors, it is likely that your Microsoft Windows installation contains out-of-date system libraries. To upgrade to their current versions, please download and run the upgrade application from Microsoft.